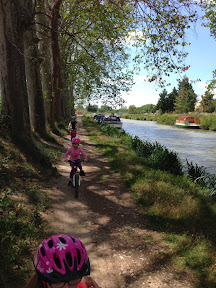 The French love their holidays and they seem to have a lot, especially in May. This last weekend was a long weekend and as Thursday was a public holiday most schools and businesses took the Friday off as well - a bridging day (faire le pont) they call it in French. James had been in Naples from Tuesday till Thursday night so we decided that rather then go away we would just do some things around Toulouse. Plus the weather forecast for the places we wanted to go wasn't that great. 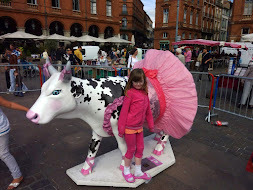 After a rather lazy start to Friday we headed off into Toulouse after lunch. 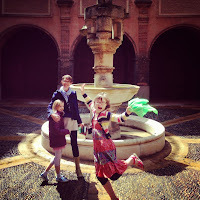 We wanted to go to the Musee de Augustins and luckily for us for some reason it was free - maybe because it was a holiday. 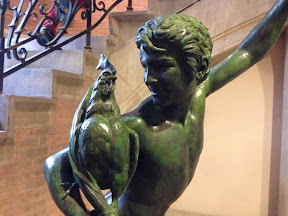 We had a great time looking at all the statues and the beautiful paintings. I love how the French are so good at restoring and using their old buildings. 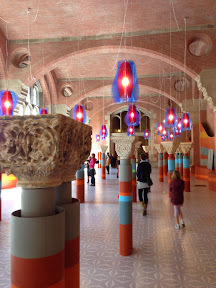 This beautiful museum had originally been a monastery and each room has been lovingly restored and used to exhibit parts of Toulousian history. Being photo bombed by Hannah! My favourite statue in the museum and Jasper's feet! 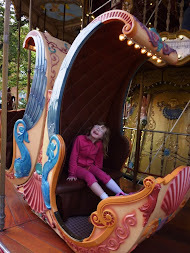 We had a lovely look around and then headed to MacDonalds for a drink and an icecream. 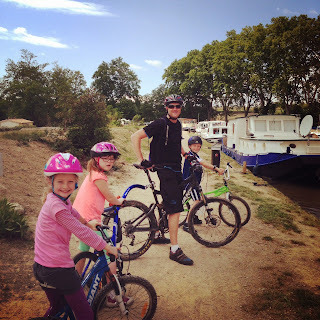 One of the things we have wanted to do while living in Toulouse is to cycle part of the canal du midi. 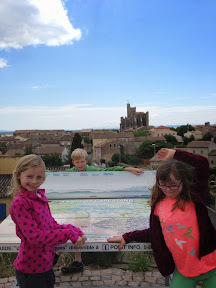 We had picked up a map in Toulouse and worked out the section that we would like to do. Saturday was quite overcast and grey so we headed to the coast as it was suppose to be sunny by Carcasonne. It was still raining at Carcasonne so we kept going. We eventually came out into the sun so stopped at a rest stop for lunch and had our sandwiches. 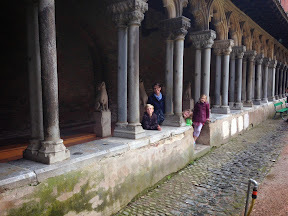 We decided to head to the coast and ended up going all the way to Narbonne. The med is renound for its strong winds and today was one of those windy days. 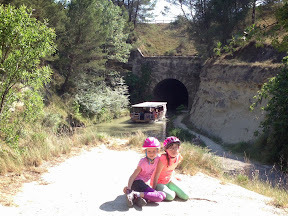 We studied our map closely and headed for a little town on the canal called Capestang. It was windy but tolerable and best of all it was warm and sunny. James unpacked all the bikes and put them all together and then we set off. Waiting at Capestang for James to unload the bikes. 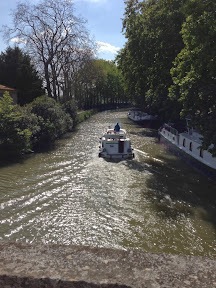 The beautiful Canal du midi. We stopped at a little village and found this lovely cafe under the trees. The owners had a very familiar sounding accent and yes they were from Auckland. So nice to chat to some kiwis again and they made great icecreams and really good coffee!!! We headed off again feeling refreshed. 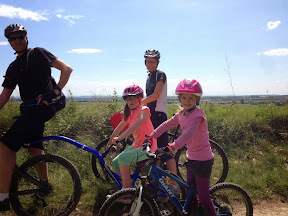 We had decided that we would cycle for about ten kms then James would cycle back and collect the car. 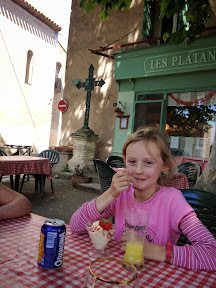 We ended up cycling just over 11km and we found another cafe and a perfect place to stop and wait. Jasper hadn't had enough cycling so jumped on the third wheel and went back with James. A good place to stop and wait for Daddy. A long day of exercise and beautiful scenery and totally worth it.